Such is the case with A Cup of Buddha. I’m sure this is Mr. Craig’s baby. I’m certain he loved it. Unfortunately this book was sent out into the world undressed. As much as I feel compassion for the author who, in his preface, tells us that he was homeless during the time the book was written, I cannot give his work a good recommendation. 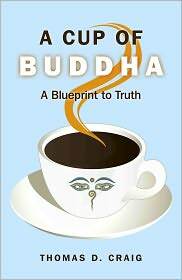 If A Cup of Buddha has a premise it’s lost in a swell of grammatical errors and meandering storytelling. The book opens with a man--I suppose himself--sitting in an office looking radiant. A miserable co worker comes in and wants to know his secret, from which they leave work, go to a coffee shop and begin to talk. The first rule of writing is to make a situation, no matter how implausible, sound believable; this scenario did not come off as believable. Further, the story line digressed to a point where there was nothing more than chapter after chapter of endless preaching, platitudes and pop culture references. Midway through the book I gave up and quit reading. I understand that British grammar varies slightly from American English grammar. But the foundations of both are the same, because fundamentally they are the same language. One of the slight variations is the use of quote marks. The use of the single ‘.’ instead of “.” to infer dialogue is used in British usage, but according to the Infomatix.sussex site (http://www.informatics.sussex.ac.uk/department/docs/punctuation/node30.html this usage is falling out of favor. Regardless, the single quotation makes the book difficult for Americans to read. However, there are errors upon which readers on both sides sides of ‘the pond’ can agree. And the ones found in A Cup of Buddha were so bad that I had an intense desire to go after them with a red pen and mail it back to the publisher. Referring to the character in question as ‘you’ is grammatically incorrect. It’s clumsy and confusing; an error that is caught quickly by most junior high school teachers and remedied. Sometimes authors like to take an avant garde approach and play with grammar, which is acceptable providing the author knows what he is doing. e.e. cummings could write about how he lived in a ‘pretty little how town’ and do so brilliantly, but the rest of us must muddle through on the foundations of modern grammatical usage. The word ‘you’ is used four times within three lines. That is a common mistake that should have been corrected during the editing process. We won’t discuss the missing comma between “you laughed and shifting in your chair.” And “you” should have run out of the back door, not out the back door. I could go on about sentence splices, run on sentences, dropped participles, tense usage, verb usage and other grammatical errors that plague this book. At this point it’s obvious that A Cup of Buddha was sent out into the world undressed. And that’s a shame because if there was something useful in this text it’s lost in a sea of poor dialogue, plot and grammatical errors. And because of this, I cannot recommend this book. I don’t put the entire blame on the author. O Book’s editors should have spotted these simple mistakes instantly and either corrected them or rejected the book outright as illegible. Publishing a book with so much wrong with it shows a disturbing laxity with this particular house. I’m not saying these things to be mean or cruel. It is my intention to only to instruct and I hope Mr. Craig takes the review in the spirit in which it was intended. I hope he goes back to the manuscript, corrects the errors, and then resubmit; preferably to another publisher.